Washington (CNN) – A coalition of atheist and secular organizations are coming together on Saturday to hold what is being billed at the largest gathering of atheists in history. Silverman initially told CNN that the rally would draw anywhere between 10,000 and 20,000 people to the National Mall, and the National Park Service has planned for 30,000 people. With thunderstorms forecast for Saturday, however, Silverman told CNN on Thursday that he expects somewhere between 5,000 and 10,000 people. 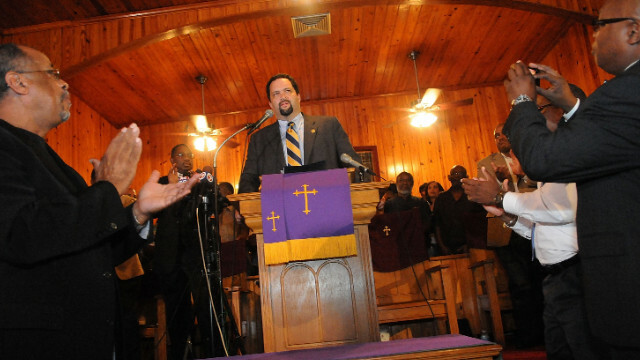 National Association for the Advancement of Colored People president Ben Jealous at a town hall meeting at Allen Chapel AME Church in Sanford, Florida about on Trayvon Martin’s killing. My Take: Where’s white church outrage over Trayvon Martin? Orlando, Florida (CNN) - In the classic Sherlock Holmes story “The Silver Blaze,” the key clue turns out to be a watchdog that didn’t bark when it should have. In the aftermath of the fatal shooting of 17-year-old Trayvon Martin in Sanford, Florida, not far from here, the mystifying missing element so far has been white outrage, especially on the part of central Florida’s religious leaders. Few if any white clergy have spoken up to demand that the killing be fully investigated. None can be seen standing by the African-American preachers calling for justice, or marching with Martin’s family members. Why? As someone who covered this area’s faith community for 15 years, I don’t think the answer is racism as much as it is cultural callousness. Week in and week out, the violent deaths and disappearances of poor, black and brown people – especially immigrants – merit a one- or two-paragraph story in The Orlando Sentinel’s (my old newspaper’s) police blotter. So when a middle-class black teen is gunned down, the reaction tends to be a shrug of the shoulders.